In the hands of babushka black sheep. Use TB2QA95 to reference this item. 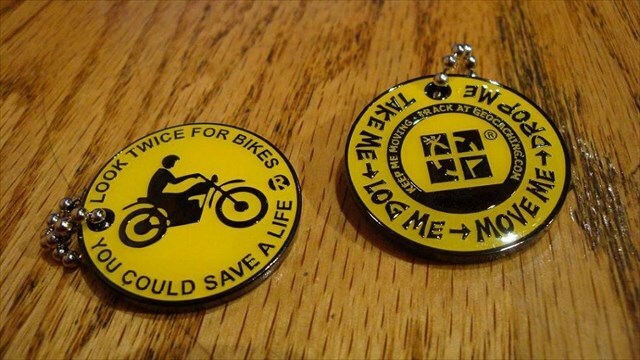 This coin is meant for make people aware for all bikers on the road. My uncle was a biker and he had a motor accident. He was hit by a truck that did`t see him. For my uncle had the accident a good end he survive but lost a leg. But a lot of bikers there is not such good end, they don`t survive it. Tod a GeoCacher and a memeber of Team Rod & Tod W/Kaboom was killed in a accident. On 12 August 2008 Tod was riding his motorcycle and he was hit by a vehicle that turnt left. This coin is a memory for Tod and all fallen bikers. We hope that a lot of people may see this coin so that more people become aware for bikers so that live`s can be saved. Please don`t keep this coin to long so that the message will be spread over the hole world. A lot of THANKS for helping this message spread. Also THANKS for BURGERSSFOUR and WRITE SHOP ROBERT for give me this coin.